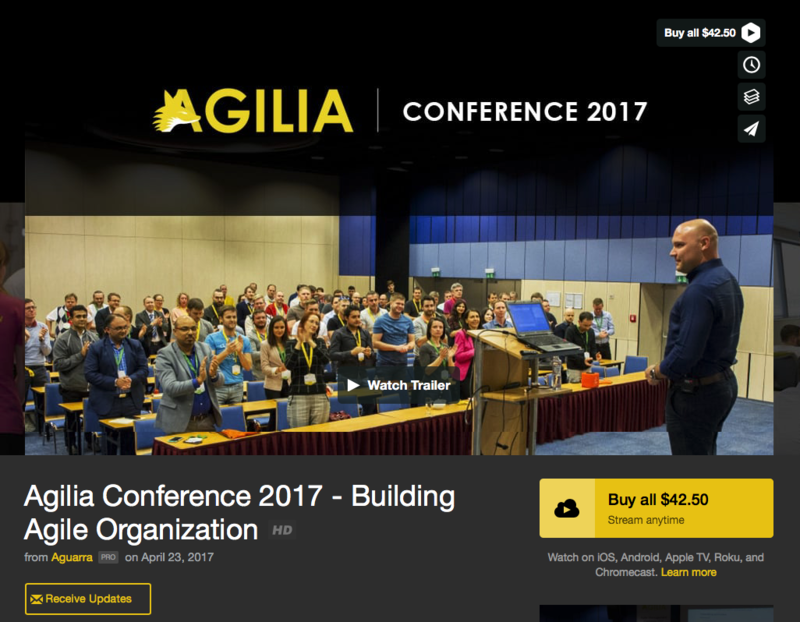 Did you know Agilia Conference launched video archive? You are here: Home › Did you know Agilia Conference launched video archive? Our conference video archive is now in full operation, after trials and tests we initiated in 2016. After 2nd Agilia Conference in 2012 I started to believe, that our conference is becoming something greater. New venue, expanded tracks, and auxiliary program, all that have had significant impact on event quality. I have also realized, we have very valuable content and it would be great to make it available to Agile community to learn. I was thinking that videotaped presentations could be available through video portal, where people can register, pay with credit card and have access to the content. As the brand of Agilia Conference grew up, I believed, we will be able to raise funds to cover development of such portal. Months later I saw it will not be so easy and when I learned more about technical issues, I had to admit I was wrong. Solution like this requires enormous resources. Since 2013 we started to capture presentations on video to have content ready once solution will be available. In 2015 we have changed TV crew to make videos more professional. And finally, in 2016 we started made the archive available to public once we found commercial solution matured enough to be suitable for our purposes. Archive currently contains nearly 80 hours of video content, nearly 100 videos and trailers, divided into 5 groups representing each conference edition. And continue expanding, with latest addition of 2017. Our business model enables currently purchasing access to each conference edition for a flat fee for the event. Price 39 EUR (and a bit less for old editions) is indeed not prohibiting anyone. And for us it is additional revenue stream which enables us covering costs of creation and maintenance of archive. We have got a lot of requests for videos, and we will see how much those were serious through sales. We believe, there is a value, which has its price. It is the reason why we never had intention to let if out for free. Probably in the future we will expand selection of possible purchase options, as the platform get matured more and enable us using new features. Agilia Conference tries to capture unique content. We address knowledgeable experts from the field. Those are often great experts, who often do not have public speaking on their priority list, no matter how much they have something to say. We ask them to prepare unique content, so there will be value even later on. With preparations of content for video archive I started to use the content as a source of inspiration for my own work. It may seem that ideas 3-4 years old are obsolete. However, I can see that even after 3-4 years they have not been implemented to the daily life and 99% of Agilists just do not know them. As we wished, the content is a great source of inspiration for anyone, who has patience to go through. I hope it will now serve also for you and you will enjoy. Write us, what do you think about the solution. We are looking forward to your feedback and opinions, how we could do better.